I've been a big fan of motorcycles for as long as I can remember. My motorbike career started out when I was about 10 years old. I bought a broken-down minibike for $10 and managed to push it a mile home with a rear wheel bearing that would seize up every 50 feet or so. 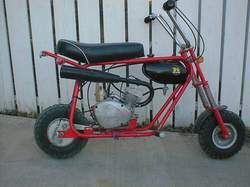 My parents were completely against minibikes at the time, but this one had a cracked frame, blown engine, and frozen wheel bearings and thus didn't look very threatening. They figured it would probably sit around gathering dust, right? Little did they know that I'd have an ally in my mission to get this little bike back up and running. My uncle had all the necessary tools to fix it and we hauled the frame up to his house where my cousin and I began welding away on the frame. We put about 12 stick welding rods into it before the frame was completely fixed, better and stronger than new. Then after replacing the clutch, engine, wheel bearings, throttle, and repainting the bike, it began to look like a new bike. My mother even joined in the fun by re-upholstering the seat. I rode that bike around the yard for hours at a time, wearing out a path in the grass. It was my pride and joy. A while later, one of my neighborhood friends had acquired a Keystone mini bike which ended up in a crash resulting in a few skinned knees and that incident precipitated a rapid sale of the bike by his dad, at a too-good-to-pass-up price of $50. So for a short time, I had two minibikes. Then something tragic happened in my neighborhood. On June 23, 1972 we had a major flood and the bikes were completely submerged in the muddy water of the Susquehanna River for several days. After the water subsided, it appeared that anything with that much mud and water in it would be unlikely to run again. I sold one to a cousin for $20, but my cousin did eventually get it fixed and running again. 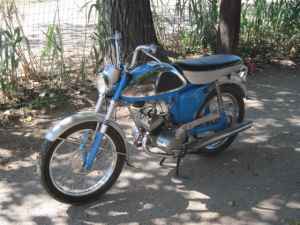 My Keystone mini bike would run again too, but one day while working on it, I lost the needle valve for the carburetor. The bike had a rather rare TAS 2-stroke motor. I called everywhere, but no one had any parts for that bike. I never did get it running again and sold it for half of what I paid for it. I really wish I knew more about fixing things back then. I could have had a new needle valve machined from scratch if I was more experienced and understood how things were made. When I was around 13 years old, I had saved enough money from my paper route to buy a real motorcycle., I bought a 1966 Yamaha 100cc twin street bike that had been converted to a trail bike. I used to ride it up in the mountains near my house, through the woods climbing up steep mountain trails. I had it for a few years, but then sold it before I was old enough to get it licensed for the street. I had always imagined I'd be able to keep it long enough so that when I turned 16, I'd be able to get a motorcycle license and then (legally) ride it on the street. That had been one of my original goals when I bought it. 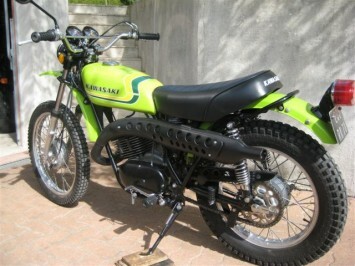 When I was 17, I bought a 1973 Kawasaki 350cc big horn. It was an enduro bike, capable of both street and trail riding and I put a lot of miles on it, using it as my primary transportation for some time. 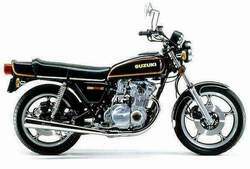 When I graduated from college and started grad school at Penn State, I sold the Kawasaki and bought a 1979 Suzuki GS550E street bike. When I finished grad school, I moved from Pennsylvania to Colorado to take a job at HP and brought the Suzuki along so I could explore Colorado on it. I used the Suzuki to take some memorable motorcycle camping trips through the Rocky Mountains. My motorcycle friends and I would take off on Fridays after work with our camping gear and not return until Sunday night. We explored the back roads and highways of Colorado, Wyoming, and South Dakota, even making the pilgrimage to the motorcycle rally in Sturgis, SD. In the meantime, I had gotten married and in 1987 we bought a 1984 Harley-Davidson ElectraGlide Classic model FLHTC complete with a sidecar. I thought that the Harley would be the last bike I'd ever own, believing that nothing else would compare to it. Terri and I took a lot of trips on the Harley, one lasting 10 days and taking us over 2500 miles through Pennsylvania, Ohio, Indiana, Illinois, Wisconsin, Michigan, and Ontario. During that trip, we also stopped at Oshkosh, WI for what's now called Airventure. I had started taking flying lessons the previous year and wanted to experience the worlds largest airshow. (Note: I've since returned to that airshow 18 times.) We also took a trip on it from Pennsylvania to Maine and back visiting towns along the New England coast along the way. It was a very comfortable bike and really felt at home on the highways. The Harley moved with us from Colorado to Pennsylvania and then back to Colorado in 1994. In the meantime, Terri had gotten her motorcycle license through an AMA motorcycle program. She rode the Suzuki a few times, but because of its seat height, she never really felt comfortable with it and so we eventually sold it. After owning the Harley for many years, I realized that I was riding it less and less frequently and began to wonder if it made sense to hang on to a bike that was spending much of its time gathering dust. It wasn't that I lost interest in motorcycling, it was just that I needed something new. I had always been interested in BMWs, and had read Robert Pirsig's book Zen and the Art of Motorcycle Maintenance: An Inquiry Into Values several times, in which the author's friend's BMW motorcycle is frequently mentioned although the author was actually riding a Honda 305. In 2002, I read Neil Peart's book, Ghost Rider: Travels on the Healing Road and fell in love with the idea of owning a BMW. One day in February 2003, I was driving from Loveland to Ft. Collins for a business meeting. I noticed a new building on the west of I25 near the Loveland/Fort Collins airport that looked suspiciously like a new motorcycle dealership. On the way back to Loveland, I decided to stop by and have a look. To my delight and astonishment, it was a BMW/Ducati dealership and they were having a sale that month. So I got a new 2003 BMW R1150RT. It is my very first new motorcycle and I have been enjoying it for 10 years now. Terri became interested in riding again and took a motorcycle refresher class from Ricky Orlando at a local track. She was so impressed with the class that she bought the 2002 Honda Rebel she used in the class and then proceeded to outgrow it in just 4 weeks! 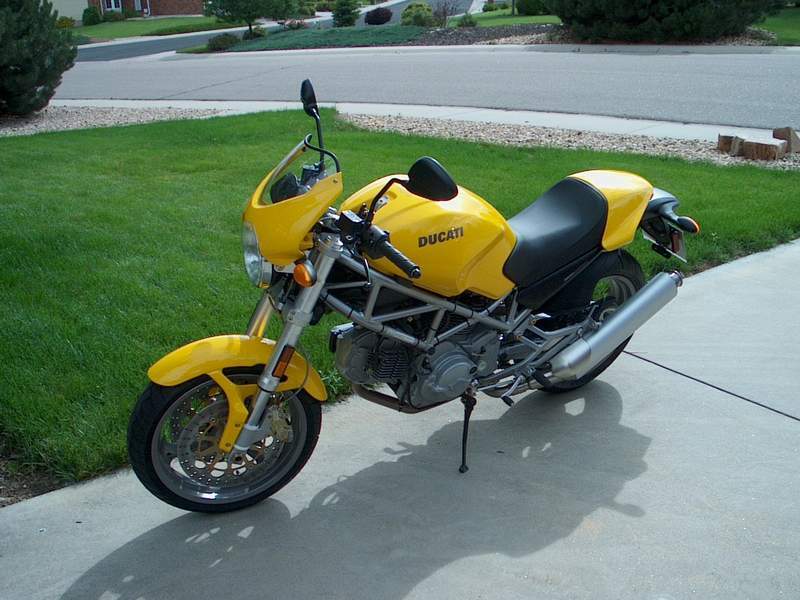 Next she acquired a 2004 Ducati Monster and got back into riding after a very long hiatus. We've taken some beautiful rides through the mountains. We've swapped bikes on occasion and I can assure you that the Monster is a wonderful bike, very light, responsive, and powerful.